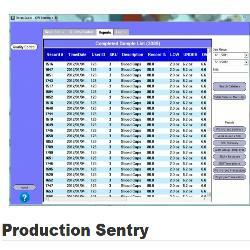 Production Sentry, previously referred to as CW Sentinel, works with the 2200CW family of scales - making it possible to record all weighments on the factory floor. In addition to the weighments, the software records logins to the scale and links these to the weight data. Production Sentry (item # SFT0008), previously referred to as CW Sentinel, is the newest addition to Doran Scales software collection works with the 2200CW family of scales - making it possible to record all weighments on the factory floor. In addition to the weighments, the software records logins to the scale and links these to the weight data.